What's Baking in the Barbershop?! 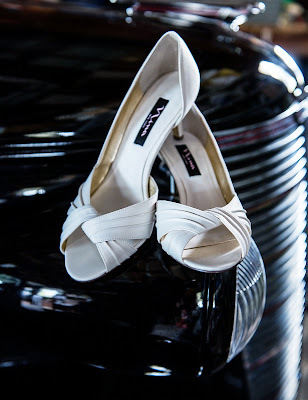 : Wedding Wednesdays: Something Old, Something New, Something Borrowed, Something Blue! Wedding Wednesdays: Something Old, Something New, Something Borrowed, Something Blue! Welcome back to Wedding Wednesdays! 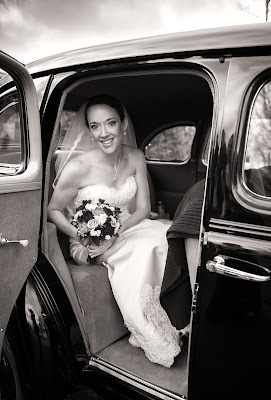 Today I thought I'd share the details of our wedding that made up the "four somethings" that every bride should have for good luck. 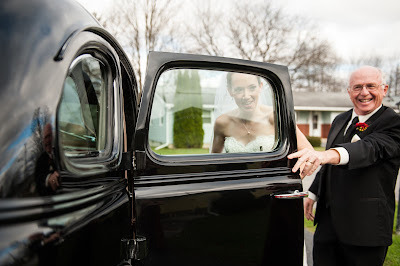 And, as always, credit for our great pictures goes to our wedding photographers, Upstate Photographers. First, let's start with "something old!" I can't remember if I have mentioned this on the blog yet, but the veil I wore on our wedding day was the same veil that my mom wore for her wedding day 33 years earlier (and that my grandmother made!)! 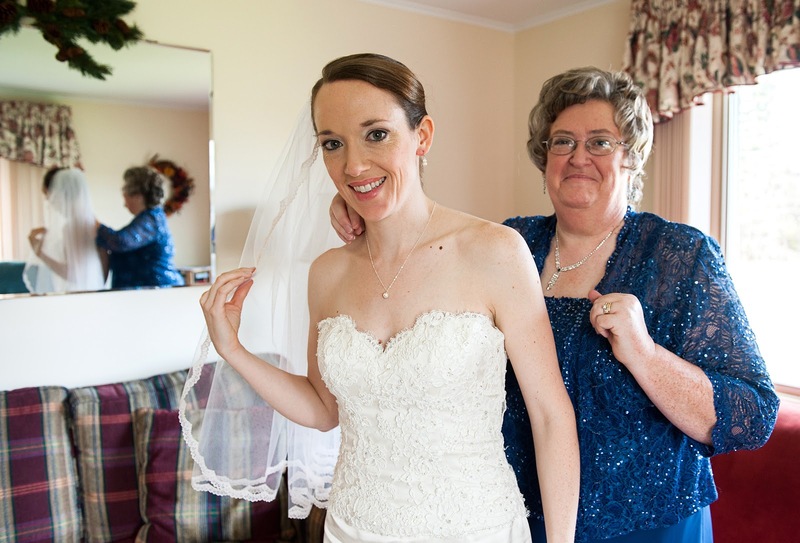 Once I had chosen my dress, we realized that my mom's veil would go perfectly with it! Veils can be outrageously expensive (just like wedding dresses can be! ), so it was not only a meaningful, special choice to wear my mom's veil, but it was also an economical choice. ;) The veil was just what I had wanted to; it was simple, with just a little bit of lace, and its length was about to my waist, which is the length I liked. The only trouble with the veil was that the lace on it was white! Aaaannnd, my dress was ivory. We were told that the veil could be tea-dyed though so that the lace would turn ivory. Thankfully, my mom volunteered to take on that crafty project! 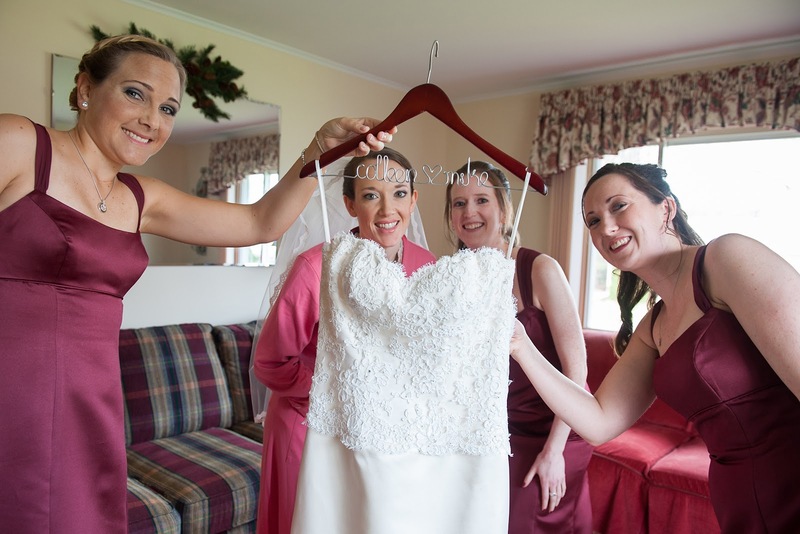 She and a good friend of ours managed to tea-dye the veil perfectly so that the lace trim was a perfect shade of ivory to match my dress. I'm so happy it worked out!! 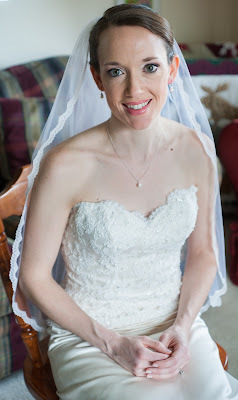 See how well the dress and veil matched?! 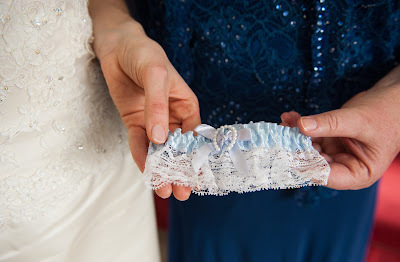 We also mentioned in our ceremony program that the veil I wore was my mother's veil, that my grandmother made, so that our guests would know the special meaning behind it! Another "something old" was my parents' '38 Chevy! It's okay to have more than one item per category, right? 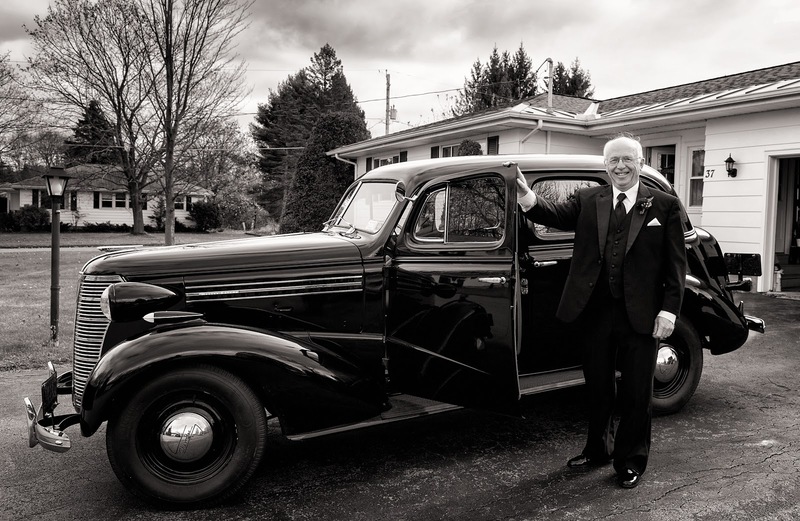 :) The car was restored just in time for our wedding, and Mike and I felt so privileged to ride away in the same car my parents rode away in back in 1979. Love it! Time for "something new!" For this one, there were many possible items that could be new... I can't say that I chose one item in particular to specifically be the one something new, but here were some things that the girls and I discussed the morning of the wedding that could count for the something new item! The "Colleen and Mike" personalized hanger I got on Etsy! My necklace! I also found this on Etsy. 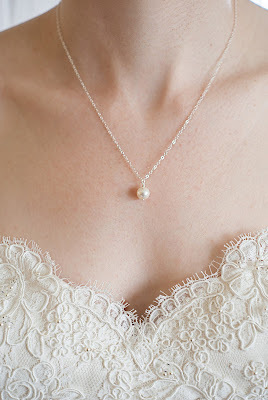 I reeeeally wanted just a simple, pearl drop necklace, but believe it or not, this was really hard to find! Luckily, Etsy came through for me (as it often does!). This one was a little tougher. Thankfully, my mother had offered me her garter belt that she wore on her wedding day! So, that became my something borrowed. 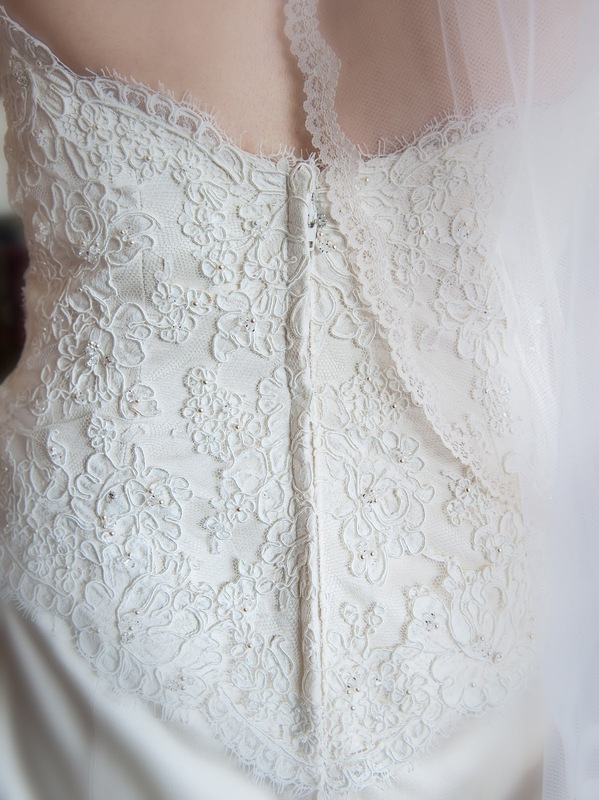 Although I did wear it for the day, we did not do the removal of the garter belt production during the reception. It just wasn't "us." Now, the garter belt could have also counted as my something blue since it was blue (as you can see!). However, I wanted to have different items for each category. Soooo, for my something blue I had blue nail polish on my toes! The day before the wedding, my bridesmaids and I went to get our nails done (manicures and pedicures, of course ;)). I couldn't decide what color to get done on my toes, and then someone suggested that I chose a blue for my something blue - what a great idea! 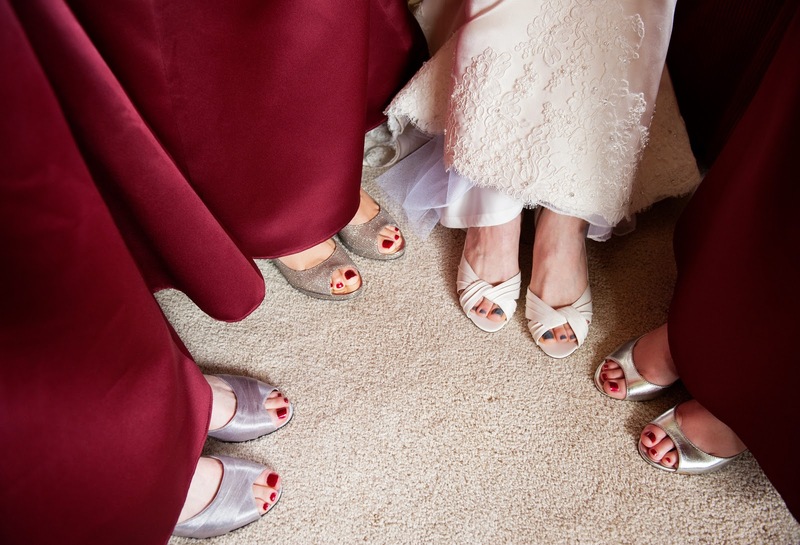 The girls all chose burgundy for their toes to match their dresses. :) And they all had silver shoes but different styles - their choice! So there you have it, my something old, something new, something borrowed, and something blue. So much fun! Hopefully all these items bring good luck and happiness to our marriage, as the tradition goes. 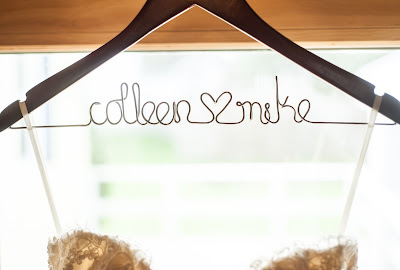 And in case you missed any of my previous Wedding Wednesday posts, here are the links to the previous ones! Scrambled Egg & Veggie Baguette "Boats"